We've had Santa Ana's all week with hot, dry winds coming from the East. 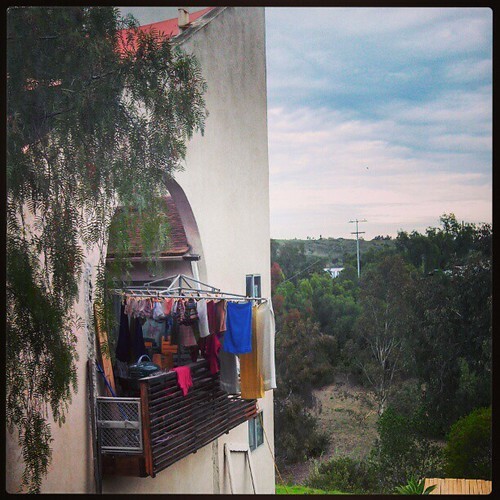 Today was breezy and lovely, perfect for hanging laundry on the line. I even did some research as to how to properly hang items, so I feel totally competent and everything. I imagine most of you are tilting your head at me and wondering why one would need to look up how to hang laundry. This skill was not one I learned as a kid; back then I systematically rebuffed all my mother's attempts to teach me how to be a girl. There were only boys in my neighborhood and I learned early and often that if you didn't want to have to play alone all the time, you better pretend not to be a girl. So cooking, cleaning, sewing... you name it, I shunned it. That's all changed, of course. Knowing how to do stuff is nice. Really nice. And today, today was a lovely day to learn. What did you refuse to learn as a child that is now become important as an adult?